If you find the Apache Lounge, the downloads and overall help useful, please express your satisfaction with a donation. A donation makes a contribution towards the costs, the time and effort that's going in this site and building. Apache Lounge is not sponsored. Your donations will help to keep this site alive and well, and continuing building binaries. Play with it, do not use in in production and post your config with the best performance. The %path%/%lib%/%include% settings were no problem. Adding /D_USING_V110_SDK71_ to every compiler staement was a lot harder. For Apache and OpenSSL (Fips) a lot of additions to makefiles were needed. Adding /SUBSYSTEM:CONSOLE,5.01 to the linker options was more of the same. Compiling PHP 5.6 for XP/2K3 has two obstacles: inet_pton/inet_ntop and GetTickCount64. The ext/sqlite3 extensions also make use of GetTickCount64. php_slite3.dll compiles and loads, but I am not sure if it really works. php_mysqlnd_qc.dll uses sqlite3 and I could not get it to compile at all. BTW: 0x0501 reflects /SUBSYSTEM:CONSOLE,5.01 for XP targetting. So far, so good. Compiling for XP could start. But some extensions did not compile yet. I got php_sockets.dll to compile by copying the complete sources for ext/sockets from PHP 5.4 to PHP 5.6. Really tricky, but it worked. php_intl.dll (international support for unicode and the like) was a different story. I finally got it to compile by changing the subsystem 0x0501 back to 0x0600 at the end of win32/inet.c. Summary for 0x0501/0x0600: configuring PHP is done with 0x0501, the core is built with subsystem 0501/5.01 (XP), but most of the extensions are built with subsystem 0600/6.00 (W7+). See the discussions under http://blogs.msdn.com/b/vcblog/archive/2012/10/08/10357555.aspx on this topic. In many cases VC11 programs will just run on XP/2K3. As a practical example: standard Apache build does not include mod_fcgid.so. I just copied the VC11 mod_fcgid.so and it ran fine. Management summary: do not use it in production. PS. I also removed REQUEST_TIME_FLOAT, so ApacheBench runs on phpinfo() without failures. I will contribute some windows 2003 Setup options and tuning. First let me give you some stats about one of my web servers which I use for running smaller websites. For medium size websites I use the same setup except with more RAM and CPU cores. The server has three partitions for a reason. Drive C: is entirely dedicated to OS and thus it suffers minimal fragmentation and has its own set of permissions. This partition can be quickly restored in case of failure. It has only 1.7 GB size. Drive D: is used for installing applications and stores the swap file. The swap file is a fixed size which minimizes the disk fragmentation and also improves performance. Drive E: is entirely dedicated to web server and php. This allows setting separate access permissions to this partition and minimizes potential access to C: partition where the OS is stored. It also allows for fast copying of various web applications between my webservers because all of them have the same setup so by copying partition E: from one webserver to another I can copy the database, php, apache, and all the scripts and then start the application on another webserver without reinstalling. This is a slim version tuned to the max and still a dog. Windows 2003R2 shows 30% better performance than Win7 x64 with only a fraction of used resources. With widows 2008 and 2012 those numbers are even worse. I will post some benchmarks using the latest Jan-E builds in a few days. I was experiencing about the same 30% difference between XP and Win7pro (same hardware, same Apache+PHP on the same SSD-drive). Then I turned off 'real time protection' in the MS Security Essentials, that was protecting both XP and Win7. The difference disappeared. Security Essentials proved to be far more aggressive in Win7Pro (64bits) than on XP. The benchmarks that I posted above are with the real time protection already turned Off. Please keep in mind that my Win 2003 as well as Win7 are stripped down, trimmed and tuned to the max with only minimum number of services running. After installing the same version of Apache 2.4.10 and PHP and giving both servers the same php.ini and httpd.conf here are benchmarks. This is much better in terms of requests /s but the memory usage on Win7 is terrible and disk usage is equally bad. And all of this is a result of 10 years of Microsoft software development and billions of dollars on RND? One more thing, time to make a backup of win 2003 is half of that Win 7. Also network traffic is cut substantially if you do backups over the network. Utilization of hardware and VPS density when running Win 2003 VPS is substantially better than any later version of windows. Thst's 18.26% of 1.5 Billion of all PCs in use. Sorry for double post but this forum does not allow to delete posts and if you accidentally hit "Quote" instead "Edit" then you end up with doubles. Windows 7 Pro is 4% slower with exactly the same setup. In both cases mod_fcgid is slower, even if I give the system the time to spawn 40-50 php-cgi's. 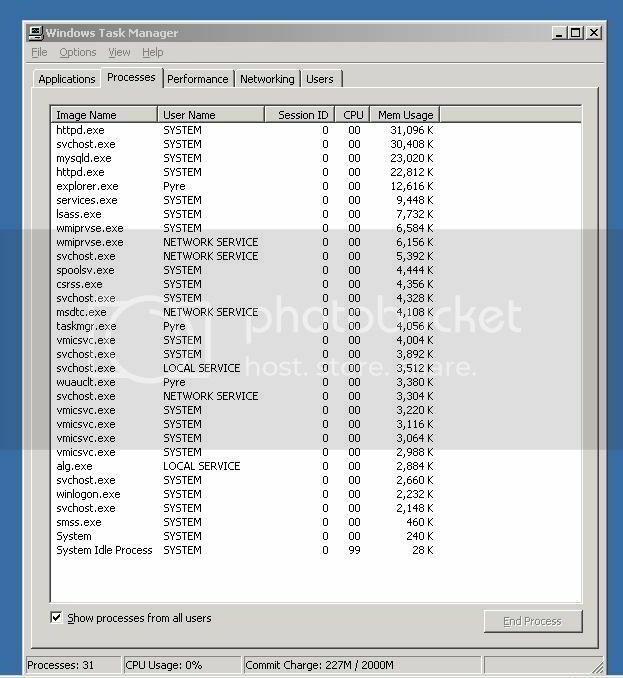 Win XP, mod_fcgid, PHP 5.6.4 nts VC11, Wincache: 762 Req/s. Win 7, mod_fcgid, PHP 5.6.4 nts VC11, Wincache: 702 Req/s. 8% slowdown on Win7 vs XP, but slower than the ts version as mod_php. There was no noticeable difference between the VC11 builds for XP/2K3 and the genuine VC11 (PGO-optimized) builds. With extly the same extensions I am getting 3700 Requests/sec on a Centos 6 box with a Intel E3-1270 v2 CPU (twice as many cores/threads, 40% higher CPU frequency). If I take the better CPU into account that is almost twice as fast as the same process on XP/Win7. In stead of spending many hours to squeeze a little bit more out of the boxes, you'd better invest in extra CPU power. I only starve little websites on one logical core. All my mother servers have 16 logical cores and 132GB of RAM and my serious websites run on Nginx and Linux with generous CPU allocation. ...If I take the better CPU into account that is almost twice as fast as the same process on XP/Win7. I have exactly the same experience on Centos 6.5. Too bad that Apache with mod_fcgid does not support multiple concurrent requests per process, without it any hosting on Apache on windows is really not very efficient. But either way 2003/XP is still the fastest platform for a webserver with the smallest footprint. For those of you that still like older versions of windows here is a method to break the 4GB memory limit. I haven't tried it on xp but on win 7 it works well. Occasionally a driver may fail but this happened to me only once with an older pci card. Why dont you just go set the paging file to be system managed ? Or is that something not included in Windows server 2003 i never used it for something like your trying to do so i can not be sure if you have access to that or not. But from my experience setting the paging file to be system managed fixed all sorts of memory limit problems. I think you would be better of using the paging file because looking at that method you linked to, It is probably making the entire system unstable and shall result in even worse problems. Actually sometimes it is enough. I run several webservers with 640K of RAM and it is plenty for a website that serves a couple thousand requests per day. Windows 2003 require very low resources. And the swap file is not being even used as long as videos are served from Youtube or CDN and there are no uploads. 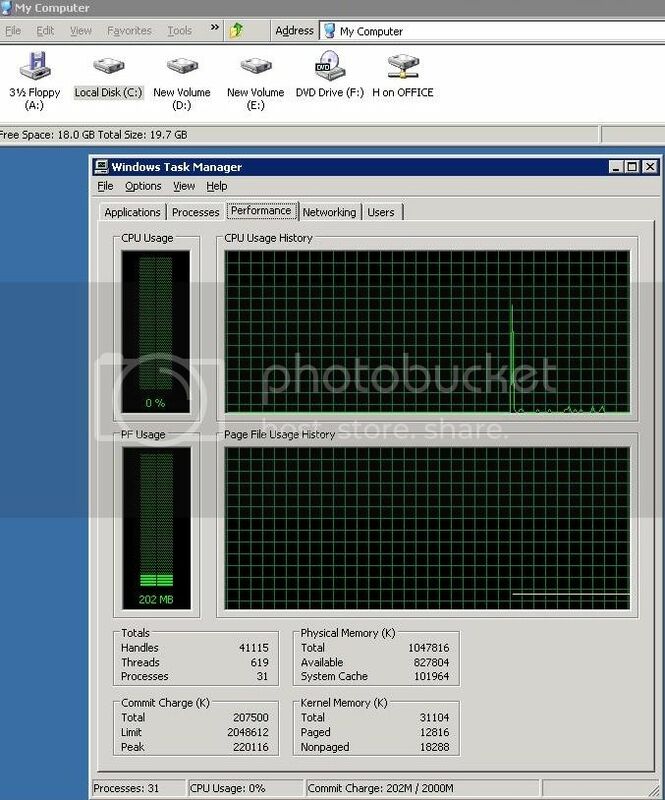 Actually Win 2003 guests on Hyper-V 2012 host with shared memory allocation make an excellent use of available resources. There is definitely a performance difference between 5.4 and your 5.6 build, your 5.6 is much faster and uses less memory. Haven't found any problems with it yet. I assume 7.0 on XP is a pipe-dream, but I can live without 7.0 since they retired all the mysql_ functions. It is a crazy amount of work, so I won't do it. I already have 20 different versions to compile: 5.3, 5.4, 5.5, 5.6, 7.0 * x86, x64 * TS, NTS. The XP version required changes in all the sources of PHP it self and of all the dependencies. This was a one time experiment. Hmm. My PHP7 builds still contain php_mysql.dll (and php_ereg.dll). Oh that is very good to hear, thanks for doing that. I had not tested 7.0 yet in production but we always compile inline with mysqlnd. I had assumed they ripped out the mysql_* support out of that? They actually include the php_mysql source? Or you took it from a previous version? Totally understand on XP 5.6. * being too much work, I might explore learning how to patch it myself later this year or next using your notes. Thanks for that, makes it easy. Posted: Thu 10 Sep '15 12:39 Post subject: optimisations with php benchmark script ? Can you advise me optimizations for windows 2012 r2 or apache or php? I had very big difference in results. Total time: : 10.502 sec. Total time: : 3.224 sec. Someone have package (apache+php) with good results ? Try running PHP7 nts as mod_fcgid.